﻿​Leaving the port of Hersonissos on our Nemo Glass Bottom Boat, we head towards our stop for swimming and snorkelling in the crystal clear waters of Saint George’s Bay, a picturesque place of sheer beauty with the white chapel of Saint George on the cliff edge and the sea cave in the rocks. After swimming, fruit salad and drinks are offered to you to cool you. The Cretan underwater environment and the seabed landscape are visible through our glass windows placed on the bottom of the boat. 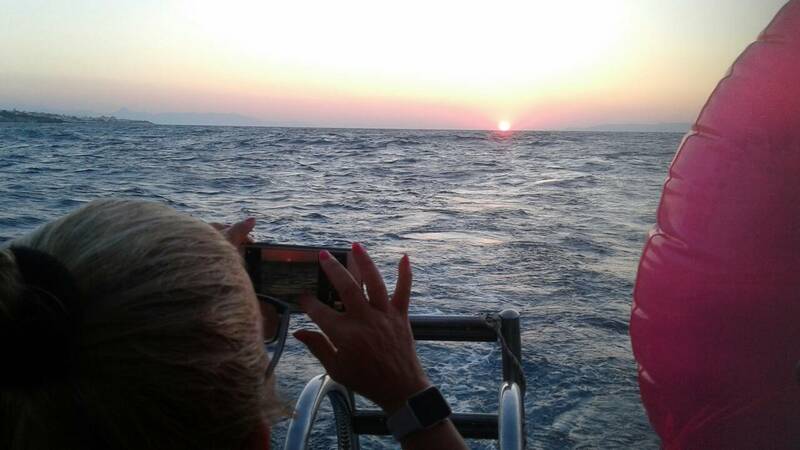 Continuing, we tour around the sea area of Anissaras and then we head on a cruise in the Mediterranean blue towards Stalida Bay. Weather permitting, we make a stop for swimming in Stalis. On the way back, we relish the shoreline view on a coast-to-coast cruise past Drapanos Cape, Gourgouthia, Saint Nicholas and Hersonissos shore. ​﻿​From Hersonissos, we take a relaxing cruise towards Stalida, enjoying the quiet afternoon atmosphere along with the coastline view. We, then, head towards the calm beauty of Saint George’s Bay for swimming and snorkelling in the crystal clear waters. There, we also have our barbecue. A scenic sunset, a rich menu, cold drinks and good music offer an exceptional and enjoyable evening trip - the highlight of your holiday! ​Routes may change due to weather conditions.